We recently did a survey of business owners of companies with under $50 million per year in sales. One of the questions we asked them was what was the single biggest reason why you haven’t been able to grow your company as fast as you would have liked. One of the biggest limiting factors holding these business owners and their companies back was the shortage of time (35% of the respondents). That makes about as much sense as running full speed on an exercise treadmill and thinking if you run faster, you’ll make it off the treadmill. The solution isn’t to work harder; it’s to get off the treadmill by working smarter. Can I be frank? There’s no such thing as having more time. We all have all the time there is. While we can change where we invest our time, we can’t make more of it. The most successful entrepreneurs have learned to invest their time for the best and highest return for their businesses. I want to share with you six powerful time mastery strategies to upgrade the time you previously spent doing low-value activities to build the business you really want. 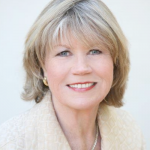 I’ve been honing these strategies over the past several years and they are largely responsible for why our average Business Coaching client has grown 7-times faster than the average privately held company in the United States. At the end I’ll point you to brand new free webtraining I just developed that will help you scale your company – without working nights or weekends. Let me start by sharing a quick story. 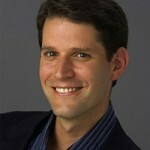 Mark Huha first came to us several years ago as a burnt out middle-stage level two business owner. For over a decade he’d grown his contracting business at a steady 4%, supporting him and his family. At the time we met his company was doing $750,000 per year in sales, but Mark was getting burned out from the 70 hour work weeks to run the company. 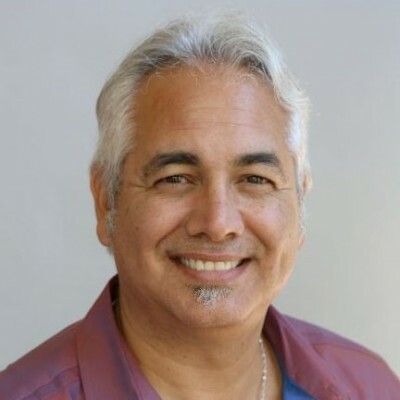 By applying the 6 time mastery strategies I’m about to share he increased his sales to over $1.5 million, and reduced his working hours down to less than 35 hours a week. Not a bad result for 36 months. The bottom line is that you don’t have to work nights and weekends to scale your business. Working longer hours is never the answer. Making better choices with how you structure your use of time is the best way to gain more time. To upgrade your use of time, first identify what you do that truly creates value for your business. If you’ve read anything on time management, you’ve come across Pareto’s Principle, commonly called the 80-20 Rule. Pareto’s Principle says that 20 percent of your actions generate 80 percent of your results (high value) and 80 percent of your actions generate the other 20 percent of your results (low value). This useful distinction becomes the basis of a refined model for using your time to create massive value, independent of the hours you put in. If you take the 20 percent of your actions that generate 80 percent of your results and apply the same distinction a second time, then 20 percent of that 20 percent produces 80 percent of 80 percent of your results. That means 4 percent of your effort (the 20 percent of 20 percent) generates 64 percent of your results. And if you can bear with us for one more math moment, apply this distinction one final time. This means that only 1 percent (20 percent of 20 percent of 20 percent) generates 50 percent of your results! That’s right; only a fraction of your highest-leverage work produces half of all your results! 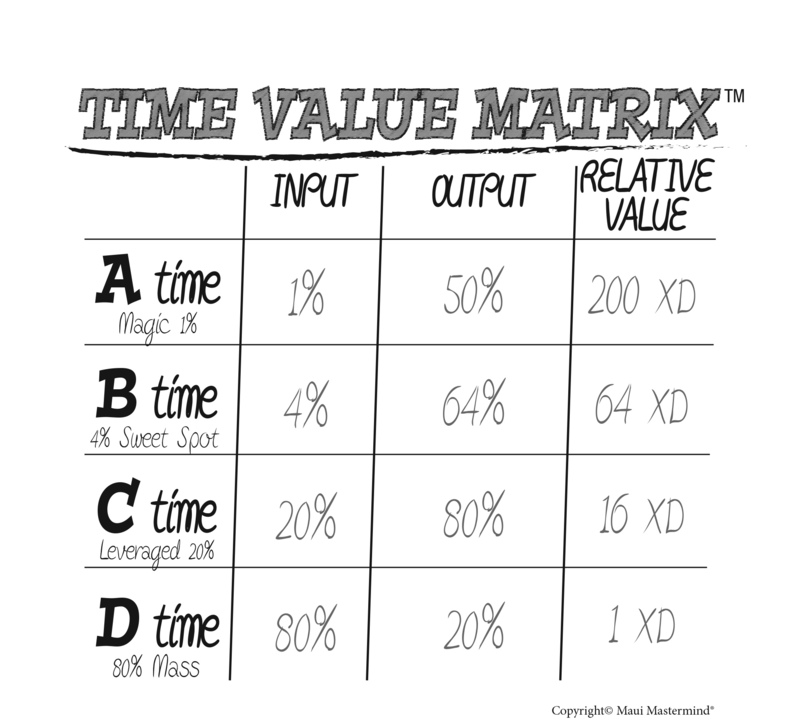 We used this idea to create something called the Time Value Matrix™—an actual formula to quickly and accurately quantify the “per hour value” of four distinct types of time: A Time, B Time, C Time, and D Time. Did you know that most business owners have no clue which of their activities fall into these four categories? So how in the world can you create more A and B time if you don’t know what activities constitute A and B time for you? Before we share with you some examples of our A-B-C-D level activities, understand that one person’s D activity may be another person’s A or B level activity—it’s all relative. Take action and examine what creates the highest value for your business at this moment in time. D Time: The 80 percent mass of unleveraged, wasteful time that only produces 20 percent of your total return. What are five of your D activities? C Time: The leveraged 20 percent that produces 80 percent of your results. What are five of your C activities? B Time: The highly focused 4 percent “sweet spot” that generates 64 percent of your results. What are five of your B activities? A Time: The magic 1 percent that generates more than 50 percent of your total results. What are five of your A activities? It’s okay if you don’t know if a certain activity is A or B level. The key is that you recognize that both A and B level activities are qualitatively higher value than a C activity and magnitudes more valuable than a D level activity. Remember, it’s limited thinking to believe that the solution is to work harder and longer. Instead, it’s imperative to upgrade your use of time. For example, if you were an attorney who charges $300 an hour, what would your D time activities be? Things like fixing a computer glitch, making copies, sorting mail, or little things you can’t bill a client for! And what would your C time activities be? Any time that’s billable, like working on a legal brief, reviewing a contract, or updating a client on legal considerations. Understand this: C time can provide you with a great income, but you’ll always have to work exceptionally hard to earn it. This is the trap that catches most high-income professionals. They seek to increase their earnings by cranking out more hours. MISTAKE! Working more hours will only take you so far; it’s just not scalable past a certain point (not to mention that when you get there, you’ll be exhausted from so much work and a stranger to your family, too!). The answer lies in A and B time. For this attorney, B time might include building relationships with other professionals who can refer valuable business, or putting systems in place so staff can get better results without tapping too much into the attorney’s time. What would A time look like? This could be speaking at a large conference where this attorney is able to generate new client relationships worth hundreds of thousands of dollars in billable services. Or it might be creating an accounts receivable system that increases the collection on all the firm’s billings by 10 percent. See the difference? You want to get D level activities off your plate; C time is needed to do your work more effectively. A and B time, however, are when you step out of the “job” of the work and do something that improves your capacity to create results, or significantly push back your biggest limiting factor (e.g., generating new clients, improving a critical system, etc.). In fact, by upgrading your use of time instead of increasing your hours worked, you can often create huge business breakthroughs while still working fewer hours. Trading time for dollars is a Level Two reaction. Upgrading your use of time to create more with less is the Level Three solution! So here’s the big question: How can you have more A and B time? You won’t get it by “trying harder” or by sitting down and saying, “Okay, let’s have an A moment right now.” Sorry, it just doesn’t work that way. That would be like a parent saying to a three year old, “Let’s have an hour of quality time right now, Junior.” How well do you think that would work? To get more A and B time, you have to fundamentally alter the way you structure your day and your week, which is exactly what the next four time mastery strategies will help you do. To “find” the time, focus first on your D level activities. This one may seem counter-intuitive, but the best place to look first to upgrade your use of time isn’t your A, B, or C level activities. It’s looking at your D level activities. Not only by definition do you spend a lot more time at this level, but it’s the easiest place to make changes because consequences of dropping them are small. So list all the D level activities you do on a weekly basis. Once you’ve identified them, you can apply the following “four Ds” to get them off your plate. Delete it. Some D activities just plain shouldn’t be done by anyone. Look at the action item and ask yourself what’s the consequences if no one did it. If it’s small, then consider just crossing it off of your list altogether. Delegate it. Maybe it’s a task that needs to get done, but not necessarily by you. Hand it off to your assistant, or a staff member, or a vendor. Anytime you can hand off a D level activity to someone, you free up both your time and your focus to do more valuable work for your business. Defer it. Maybe this task needs to be done and done by you, but should it happen right now? Sometimes delaying the action is the smartest choice. Design it out. If you find yourself handling a recurring D activity over and over, instead of doing it, improve the process or system to keep the task from coming up in the first place. For example, if you get the same seven customer questions repeatedly, post a FAQ page with the answers on your website. Or perhaps you can preempt questions by giving new clients a “quick start” booklet that proactively answers these seven questions. Or maybe create an instructional video on your website that gives new clients your best presentation while answering these common questions. You get the idea. Designing out a recurring activity is the very essence of building a systems-reliant Level Three business. It simplifies processes and empowers your team to get consistently great results with less and less reliance on you, the business owner. Structure your week to reinvest your “saved” D time in A and B activities. Set aside one Focus Day every week. On your Focus Day, get outside of your normal environment and work on the highest-leverage, highest-value, highest-return part of your business. Do the A and B level activities that add real value. This could mean building out a baseline operational process to use with new clients. Or you could spend the day creating a hiring system to consistently supply you with quality team members for your sales team. Or you might call on your two most important prospective customers or joint venture partners to deepen the relationship or close the sale. The key is to set aside a full day a week for this and make sure your team supports you in keeping this time clear so you can invest in these high-leverage activities. Work first “above the line” and live by the Results Rule™. Most business owners start each day with high hopes. They take a moment to write down the list of tasks for that day—a list that often grows to 15 or 20 items. But then the day hits and they find themselves pulled off track to deal with customer challenges, operational fires, or sales emergencies. Here is a different way to organize each day. When you sit down in the morning (or the night before, if you prefer), choose three bottom lines for that day and write them at the top of your to-do list. Draw a line under them to visually mark them as different and special. Make two of them business related and one of them personal. Your bottom lines are the action steps you’ll take that day that will create the most value for your business. Almost always these are A and B level activities. Live by the Results Rule which says that by 10:30 a.m., you should have either completed each of your three bottom lines or have scheduled a definite appointment time to complete them. This technique is powerful because it pushes you to do what matters most first. Every “Push Day,” schedule “Prime Time” to work on A or B activities. Everyone has a certain time in the day when they’re at their best. A Prime Time block is a 60 to 90 minute appointment that you set for yourself for your peak effectiveness time. That’s when you work only on your highest-value items (usually your “bottom lines” for the day). By blocking out this time as an actual appointment on your calendar, you guarantee yourself at least one hour each Push Day to have a focused block of time to create real value for your business. Create a “Stop Doing” List and add to it weekly. Too many people live their lives based on a to-do list to which they keep adding more and more tasks. But they rarely make the hard choices of what to let go of, what to delay, what to delegate, what to delete altogether. Look at your to-do lists from the past 60 days. Which activities can you add to your “stop doing” list and how much time will that save you? Each week, pick a few more activities you deliberately choose to add to your “stop doing” list. You’ll find that the items you put on it tend to be tasks you find draining—maybe ones you put on your to-do list out of obligation or inertia. When you get rid of them, you’ll enjoy a sense of elation and energy plus have a much higher performance level in your other time. I hope you found these ideas on upgrading your personal use of time so that you could grow your business and work less helpful. If you want to learn more, I’ve just finished designing a brand new web training called, Five Simple Steps to Scale Your Company Without Sacrificing Your Family, Health or Life. In this free web training I’ll share with you our S.C.A.L.E. 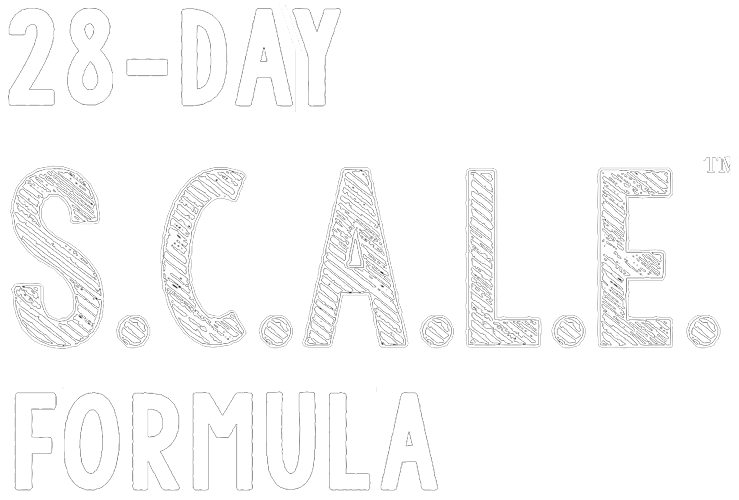 Formula™ for growing your business and getting your life back. Essentially what the training will do is show you – step-by-step – how to grow your company by reducing its reliance on you. It’s the best 90-minute reformulation of what I shared in 288 pages of my last bestseller, SCALE, which I wrote with Priceline.com co-founder, Jeff Hoffman. Click here to learn more about this free web training. I hope you register and join me for the session. Good luck to you in growing your company.